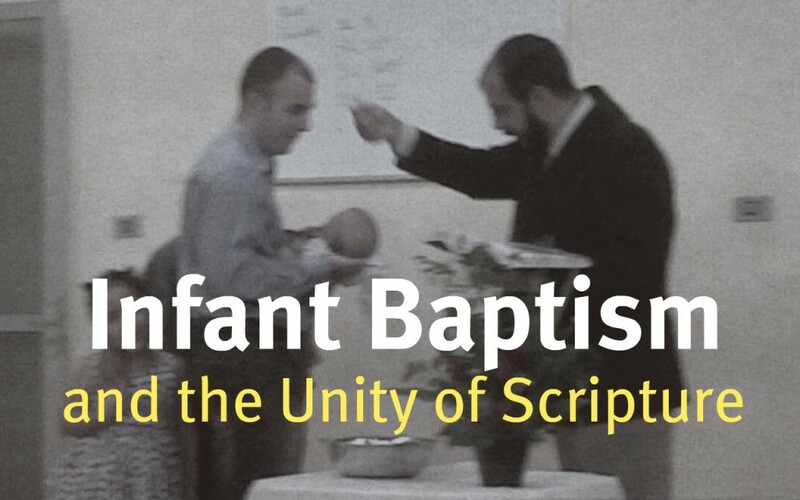 It’s standard fare that Canadian Reformed people have their infants baptized. Around us are countless Christians who don’t think the Bible teaches infant baptism. Our younger and not so young members meet these other Christians, end up talking about baptism – and questions arise about whether the Lord actually wants the newborns of the congregation baptized. Then it’s pointed out that there is no text in the New Testament commanding the baptism of children; in fact, the New Testament does not even have examples of children actually being baptized. So our questions become bigger: is infant baptism simply a (Canadian) Reformed peculiarity that ought to be jettisoned in the name of Biblical faithfulness and unity with fellow Christians? What are the grounds for infant baptism?! It must be granted that the New Testament nowhere contains a text explicitly commanding the baptism of children. (That there are no instances of children being baptized is debatable, but I hope to come back to that point in a later blog post.) The question that needs to be asked now is why one would even expect the New Testament to have such a command. Funny comment, you say? Well, foundational to the whole discussion on infant baptism is whether the New Testament is the ‘real’ Bible, a book to be read on its own, or is the New Testament to be read in the light of the Old Testament – with both testaments together making up the ‘real’ Bible? Is there continuity between the Old Testament and New, or discontinuity? The New Testament is habitually contrasted with the Old Testament. The God of the Old Testament, we’re told, is stern and demanding while the God of the New Testament is loving and merciful. The God of the Old Testament insists on law, while the God of the New Testament gives His Son for our sins. There is, then, a discontinuity between the Old Testament and the New Testament, with the manner of God’s dealing with people today different from the way He dealt with people in the time of Moses and David and Jeremiah. In the Old Testament He had a covenant rooted in blood, one made even with children; in the New Testament He loves those who believe in Him – something little children do not do. The result of this view is that markedly more sermons are preached in North America today from New Testament texts than from the Old Testament (though the Old Testament numbers twice as many pages as the New Testament). Though the Old Testament remains in the Bibles circulating in our society, it’s the New Testament that ends up dog-eared and marked. And since the New Testament does not explicitly speak of infant baptism, this long-held practice of the church falls into disrepute…. Jesus says to the Jews: “You diligently study the Scriptures because you think that by them you possess eternal life. These are the Scriptures that testify about Me” (John 5:39). In this passage the phrase “the Scriptures” can only be a reference to the Old Testament since the New Testament was not yet written in the days of Jesus’ earthly sojourn. The topic of the Old Testament Scriptures, says Jesus, is none else than Jesus Christ Himself. Jesus’ teaching was not different from the teaching of the Old Testament, but was the instruction of the Old Testament made plain. After His resurrection from the dead, Jesus joined the two disciples on the road to Emmaus. In response to their disappointment at Jesus’ crucifixion and their confusion about the empty tomb, “He said to them, ‘How foolish you are, and how slow of heart to believe all that the prophets have spoken! Did not the Christ have to suffer these things and then enter His glory?’ And beginning with Moses and all the Prophets, He explained to them what was said in all the Scriptures concerning Himself” (Luke 24:25-27). Jesus’ reference to “Moses and all the Prophets” is obviously the Old Testament Scriptures. According to Him, the message of the Old Testament is none other than that “the Christ had to suffer these things” – and the disciples should have known that. He then went on to make plain to these disciples just how the Old Testament spoke of Jesus Christ. It does not go too far to insist that Jesus’ opening of the Old Testament to these two disciples trickled down to all the apostles and so coloured the way the disciples later used the Old Testament in the sermons mentioned in the book of Acts and in the letters they wrote to the churches. The apostle to the Hebrews tells his readers that “Christ is the mediator of a new covenant, that those who are called may receive the promised eternal inheritance – now that He has died as a ransom to set them free from the sins committed under the first covenant” (Hebrews 9:15). The apostle’s closing words in this quote are intriguing. The “sins committed under the first covenant” are the sins of the Old Testament dispensation, sins committed while the sacrificial system of the Mosaic Law was in effect. Yet how could those sins be forgiven? The apostle insists that it is Christ’s death that sets the Old Testament people free from their sins! How that’s so? That’s so because the sacrifices of the Mosaic Law foreshadowed the sacrifice of Jesus Christ on the cross. The blood of goats and calves did not by itself wash away Israel’s sins, but that blood directed the Old Testament sinner to focus on the coming sacrifice of the Lamb of God on Calvary. The point is this: the essential message of the Old Testament is identical to the essential message of the New Testament. Holy God has a relation with sinners in both the Old Testament dispensation as well as in the New Testament dispensation. This relation is possible in the Old as well as in the New Testament only because of the blood of Jesus Christ. The Old Testament looks forward to the Christ who will come (and by His coming sacrifice believing sinners were reconciled to God), while the New Testament looks back on the Christ who has come (and by His completed sacrifice believing sinners are reconciled to God). There is an essential continuity between these two Testaments on the subject of how God relates to sinners. Abraham and Moses and David and the rest of the Old Testament saints were Christians as much as Paul and Augustine and Calvin and the rest of the New Testament saints were and are Christians. Perhaps you will counter that the New Testament is surely called ‘new’ for a reason. Did Jeremiah not prophesy of a “new covenant”? Indeed, he did. “‘The time is coming,’ declares the LORD, ‘when I will make a new covenant with the house of Judah…” (Jeremiah 31:31). As a result we read repeatedly in the ‘New’ Testament of a “new covenant” (1 Corinthians 11:25; Hebrews 9:15). But the word ‘new’ is not to be contrasted with ‘old’ – as your ‘new’ car is a totally new machine from your ‘old’ one. The same word that’s translated in Jeremiah 31 as ‘new’ appears in Psalm 104:30 to describe springtime: “When You send your Spirit, … You renew the face of the earth.” The same word appears also in 2 Chronicles 24:4 to describe Joash’s plan “to restore the temple of the LORD.” Because of Israel’s hardness of heart in their service to God, the Lord promised through Jeremiah to make a “new covenant” – yet not one that is essentially different from the covenant God made with their fathers when He took them out of Egypt, but one that reaches deeper into His people’s heart. For this time “I will put My law in their minds, and write in on their hearts. I will be their God, and they shall be My people” (Jeremiah 31:33). Note those closing words: this covenant is described with the same words as God used for His relation with Abraham and with Moses so long ago (Genesis 17:7; Exodus 20:2). It’s the same covenant –“I will be their God”– yet ‘new’ in that it’s renewed, refreshed, deepened. I need to belabour this unity between the Old Testament and the New Testament. Writing to Christians of Rome, Paul claims that Abraham “is the father of all who believe” (Romans 4:11) – and the context makes clear that the word ‘all’ refers to both the Jew (of the Old Testament) as well as the Gentile (of the New Testament dispensation). Paul adds, “Therefore, the promise comes by faith so that it may be by grace and may be guaranteed to all Abraham’s offspring – not only to those who are of the law but also to those who are of the faith of Abraham. He is the father of us all” (Romans 4:16). We need to catch his point well. The Christians of Rome had no Jewish blood in them and so were not children of Abraham by birth. Yet Paul insists that this foundational figure of the Old Testament was “the father of us all,” Jews and Romans alike. That is: Old Testament believers and New Testament believers have one father, Abraham. How are we to understand this? The apostle wants us to think of a tree. Because so many Jews rejected Jesus Christ as the fulfillment of Old Testament prophecy, God (says Paul) broke those fruitless branches off the tree of Abraham. But since God wanted His tree to bear fruit, He in mercy grafted new branches –Gentiles– into this same tree. These Gentiles then are as much children of Abraham as were their believing brethren of the Old Testament (see Romans 11:17-24). There is, then, one tree-of-faith spanning both testaments, a single tree rooted in Abraham, sustained by faith in Jesus Christ, and bearing the fruit of the Holy Spirit. This is why Paul can elsewhere say that “there is one body and one Spirit …, one Lord, one faith, one baptism; one God and Father of all” (Ephesians 4:4-6). The faith of the Old Testament is not different from the faith of the New Testament, no more than the God of the Old Testament is different from the God of the New Testament. There is a profound and essential unity (and hence continuity) between Old Testament and New. How does this touch upon infant baptism? Like this: given the continuity between the Old Testament and the New, one must expect God’s pattern of dealing with sinners in the New Testament to be same as His pattern of dealing with them was in the Old Testament – unless God explicitly tells us of a change. In relation to the sign of the covenant (circumcision in the Old Testament) He has in fact plainly told us of a change for the New Testament dispensation (a topic to which we’ll return in a later chapter). But there is no explicit instruction in the New Testament indicating that His inclusion of children in the covenant in the Old Testament is replaced by a different pattern in the New Testament. That is why I asked at the beginning of this chapter whether we need an explicit command to baptize infants before we can adopt the practice. Insisting on such a command presumes that the New Testament is not built on the foundation of the Old Testament, presumes that in the New Testament dispensation God’s covenant with sinners as it operated in the Old Testament was torn up and an entirely new manner of relating with sinners was developed for the New Testament dispensation. Yet that premise turns out to be false; on the subject of how God deals with sinners there is between Old Testament and New not discontinuity but essential continuity. This doesn’t, for course, answer all questions. So I hope to take the matter further next time. Meanwhile, if we’re convinced again that the Bible needs to be seen and read as a unity, we’ve made progress.